Ok, you've found the site and hopefully are interested in the prints of Luigi Rist. I bet you have some questions; why is it here, who's behind it, and where is it going? Still working on print catalog...just about done. Why is the site here? Well it's not here for commercial reasons. I collect Rist prints and was surprised that where no sites on Luigi Rist already. My goal is to showcase the work of Luigi Rist and have a place for people who are interested in his art to communicate. However, the reason that got me started had nothing to do with art. I teach a Certificate course for the University of Washington three times a year dealing with the basics of software testing. I needed a simple class room example for students to practice some concepts of software quality assurance using the WEB. I decided to construct a real WEB site and let them use it to study testing tools and techniques. The site I use in the class is not this production site, but some of the pages and updates are tested by students before I put them up for public use. As you can see by the home page, my goals for the site are grand and will need lots of help if it is to grow and improve. I don't need money...what I do need is material, people to maintain the different pages, ideas, information, relevant links and lots of word-of-mouth. As long as I own the domain "luigirist.com", no ad banners! I need content! I am collecting information from a variety of sources, however, most of it is in printed form. I am scanning it and editing. If you have the equipment, please submit material in electronic form. If not, you can send originals to me to scan and return (photos and documents). Contact me for file formats. JPG pictures of all the prints. (at least 250 pixels wide in jpg format, no compression or "best" quality). These will be used for the catalog/checklist. Information on past, current, and future exhibitions. Dates, location, sponsors, etc. Collections. Both private and public. Who owns what. Where can one go to view prints (names, locations, dates, etc) on public display. Sales and auctions of prints. Papers, articles, etc...published and non-published (with permissions). Articles and papers on the subjects mentioned on this site (like restoration and conservation). People who would be willing to maintain part of the site (again, like the care and restoration pages). If you know of someone who has Rist prints, tell them about the site. Get them to contribute something in writing about how they got started, what they own, stories about Rist and/or his wife, etc. Below is a list of people I have contacted and who sent material and/or have given permission to use source material. If somehow I have used material that you have authored and/or own copyright, and I have not given you credit, please contact me so I can rectify the situation. Who's behind luigirist.com (in no particular order)? My name is Tom Gilchrist and I live in Renton, WA near Seattle. I am a collector of prints by Luigi Rist (I have over 16 of them). I am an Associate Technical Fellow for The Boeing Company in computer software for non-airborne software development (software to run the factory, not to fly planes). I am active in a number of hobbies including Garden Railroading, Ham Radio, Skiing in the Winter, etc. I have a home page you can visit if you're interested. I am not an artist or a dealer. I do purchase art from time to time (when I can find a Rist print at a reasonable price). I got interested in Rist prints through an aunt, Mrs. Karl Miller (Irma Miller) who lived in Baltimore, MD most of her life and retired to Chestertown MD, where she passed away in 1999. I visited her from time to time and commented on her collection of art work. I especially liked the smaller print called "Corsages" by Luigi Rist. On one visit, she asked if I wanted one of her Rist prints and which one I wanted. She told me that while I liked the "Corsages" print, the one I should take was one called "Sunflowers" (which was much larger) which I did. Over the years, I talked to her more about her collection, how she got the prints, and etc. One-by-one, I was given her 6 prints over a 5 year period of time. I purchased the others on my own. My email is tomg@luigirist.com. BARBARA WHIPPLE (1921-1989), as well as being a painter and print­maker, was a teacher, lecturer, and writer of articles on art education. She earned three degrees, finalized by a Master of Fine Arts from the Tyler School of Temple University. Her prints have won prizes and hung in group shows all over the country. She also has many one man shows to her credit. Most of what has been published about Rist and his techniques are due to her work. Through the continuing efforts and work by her husband, Grant Heilman, the writings and photographs are still being made available. Material by Barbara Whipple and permission for use on this site was supplied by her husband, Grant Heilman who is retired and living in Colorado. 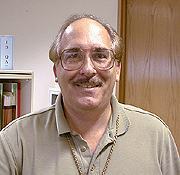 Grant is the source for all of the material by Barbara Whipple (his late wife). He made his living as a professional photographer and his studio is still in business, though Grant is retired and living in Colorado. He took many of the photographs used in articles by Barbara and others. Some of the photos are the only records known of Rist's works. Her father, Ted Braithwaite, was a close friend of Luigi Rist for years and was one of the key figures who helped promote Rist's prints (through the Christian Science Monitor, where he worked). 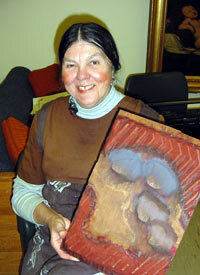 She and her sister, have produced a book of Braithwaite's art and have their own WEB site. Joan can be contacted at haller@lostladies.com. Joan Charles is retired from the City of Hampton where she worked 10 years in the local museum. She presently researches shipwrecks, local African-American history, and Sigurd Skou. Joan has two books on local court record abstracts (out of print) and a book on shipwreck accounts (also out of print). Sigurd Skou was married to her father's favorite sister, Bertha Dickey. Sigrud died before she was born, so she never knew him personally. 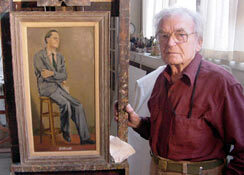 A good friend and contemporary of Luigi Rist, Mr. Konrad lives in rural New Jersey with his wife not far from Ashbury. He has a wealth of information about Rist and his family and painted the two portraits of Rist on this site and has supplied a number of other items for use in this site including a sketch of the Rist farm and a number of photos from his collection. He also allowed me to take photos of a number of Rist prints and artifacts used by Rist in his work. I was able to visit him in the November of 2001 where I took many photos used in this site. I have also had a number of conversations on the telephone with him about Rist. Adolf Konrad is a well known artist in his own right with many shows and awards for his art. I understand a WEB site is being produced on his work and I'll include the link here as soon as it's ready. Director of the Phillips Museum at Franklin and Marshall College and the building I am located in is spelled Steinman >College Center. Carol Faill is the Director of the Phillips Museum at Franklin and Marshall College, Steinman College Center in Lancaster, PA. The color photographs of the wood blocks of the print "Fruit Dish" is in the collection she curates. These blocks were used in the August 1971 article by Barbra Whipple in the American Artist Magazine "Luigi Rist; Printmaker in the Japanese Tradition. The original photos in B&W were taken by Grant Heilman. Ms. Faill allowed me to take color prints of the blocks to insert in the article included in this site. She also supplied information on print terminology and print restoration and archival included in this site. Revised: 14 Mar 2013 22:01:33 -0800 .